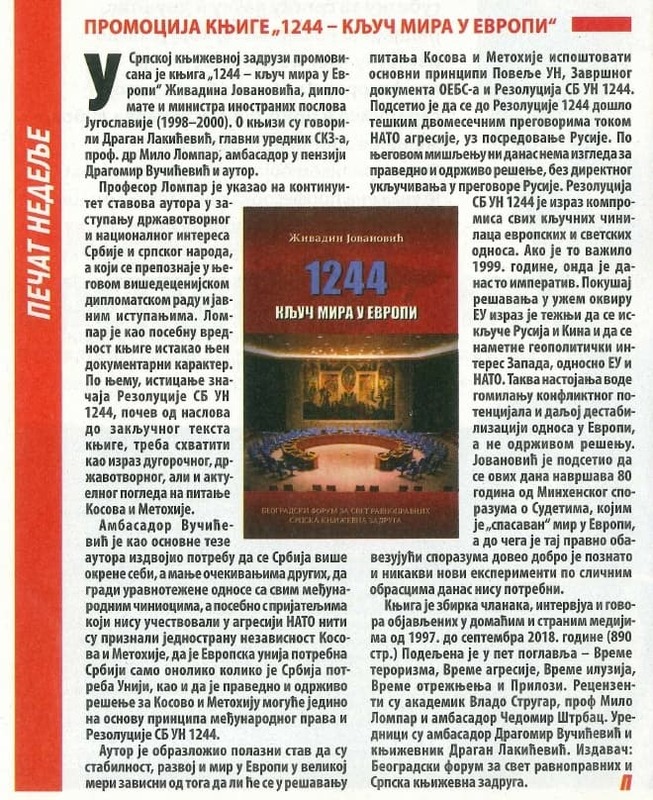 The oldest Serbian Publishing House - Serbian Literary Cooperative – has recently promoted the book “1244 – A Key to Peace in Europe”, authored by Živadin Jovanović, a former foreign minister of Yugoslavia (1998–2000). The book was presented to the audience and the media by Mr. Dragan Lakićević, Editor-in-Chief of the Serbian Literary Cooperative, Prof. Milo Lompar, Ambassador Dragomir Vučićević (retired), and Author. The book is a collection of the author’s articles, interviews and public speeches related to the Autonomous Serbian Province of Kosovo and Metohija which have been published of the past 20 years (from 1997 through September 2018. The book (890 pages) comprises 5 Chapters: The Time of Terrorism, The Time of Aggression, The Time of Illusions, The Time of Waking up, and The Documents. The reviewers are Academician Vlado Strugar, Prof.. Dr. Milo Lompar, and Prof. Čedomir Štrbac and the editors Ambassador Dragomir Vučićević (retired) and the writer Dragan Lakićević. The publishers: The Belgrade Forum for a World of Equals, and the Serbian Literary Cooperative. 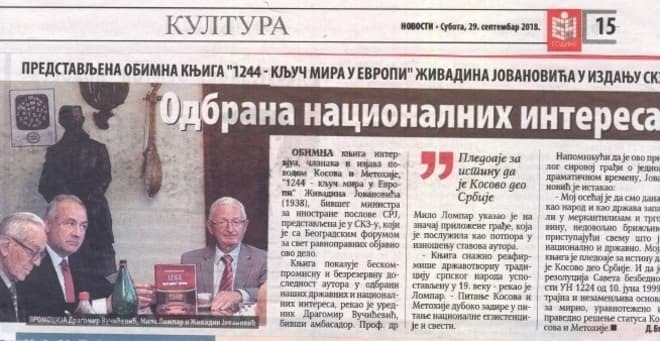 According to Professor Milo Lompar the book reflects continuity of the author’s views on statehood and national interests of Serbia and the Serbian people, readily recognizable in his decades-long career in diplomacy and in his public engagements. Author’s continuous advocacy for the full respect of the basic International Law Principles and UN Security Council Resolution 1244 in resolving the problem of the Serbian Province of Kosovo and Metohija reflects both – his understanding of the long-term and current importance of Kosovo and Metohija, not only for Serbia and the Serbian people, but also for the peace and stability in the Balkans and Europe. With over 1.300 Serbian medieval monuments, headquarters of the Serbian Orthodox Church Patriarchy - Kosovo and Metohija is deeply interwoven in the state, national, cultural and religious identity – considers professor Lompar. He concluded that the book of Mr. Živadin Jovanović reaffirms the statehood roots and tradition of the Serbian nation re-established in XIX century as well as the right to equality and self governance of all citizens and national communities living in the Province regardless of their nationality or religion. He particularly praised high documentary value of the book as its special feature. Speaking about the author’s key theses, Ambassador Dragomir Vučićević singled out the need for Serbia to dedicate much more reflection on herself and her long-term interests, and to a lesser extent on the current expectations by the international stakeholders, since the latter, in their positioning vis-à-vis Serbia, are guided solely by their own geopolitical interests. Serbia should adhere to the fundamental principles of the international law and the UN SC resolutions, regardless of who may or may not find it suitable, and develop balanced relations with all international actors, particularly with proven, long term friends who did not partake in NATO aggression and have not recognized the ensuing illegal, unilateral secession. Vučićević also highlighted the author’s thesis that Serbia needs the European Union only to the extent the European Union needs Serbia, and that EU membership is a legitimate goal insofar it is not conditioned by surrendering her sovereignty and territorial integrity. A just and durable solution for Kosovo and Metohija is only possible on the basis of observing the principles enshrined in the UN Charter, the OSCE Final Act (1975), UNSC Resolution 1244 (1999) and the Constitution of Serbia. Attempts to impose on Serbia solutions which legalize violations of the basic principles of International Law and of European Security and Cooperation as well as UN SC resolutions would pave the way to the spreading of instability and the build-up of conflict potential in the Balkans and in Europe – warned Vučićević.